Limitless power. No instruction manual. Charlie Wilde can’t believe she has to move to hot, boring Arizona. Good-bye, deep-dish pizza, her best friend, and everything else she loves about Chicago. Hello, cacti around every corner, parents who spend all their time at their new jobs, and trying to fit in at a new school. It couldn’t get any worse. Then one day Charlie finds a high-tech bracelet that looks just like the ones athletes use. There’s no sign as to where it came from, but she decides to wear it to soccer tryouts, thinking it’ll help give her an edge. And things start to look up when she makes the team and hits it off with Maria, the captain, and Mac, Maria’s best friend. But soon Charlie begins to notice she’s changing. She’s able to run across the field as fast as a cheetah and lift heavy objects as if she were as strong as an elephant—and that’s only the beginning. Charlie would be thrilled about her transformation if she had any idea how the bracelet works, but it didn’t come with instructions. So it’s up to her and her new friends to figure out what’s happening—and if there’s a way to control her incredible powers. Charlie knew moving was going to completely change her life, but she never could have guessed how right she really was. . . . 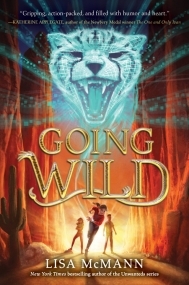 GOING WILD is the first book in a middle grades science fiction trilogy by bestselling author Lisa McMann. In the book, Charlie Wilde is not happy at all when her mom accepts a new job in Arizona. Leaving her friends and Chicago, the city she loves, behind is difficult enough. Doing it in the middle of the school year makes the transition even harder. Fortunately for Charlie, her new school has a sixth grade girls’ soccer team, and try-outs take place just as she’s starting at the school. As a bonus, someone has left Charlie a cool new bracelet that gives her confidence a boost when she wears it. GOING WILD begins in darkness—the opening pages are even black with white lettering. As the story starts there is a theft, a chase, and a kidnapping … and then the reader is introduced to Charlie and her moving woes. Charlie is a classic pre-teen: she’s sometimes fun, sometimes sullen, occasionally angry, and always fully immersed in her own thoughts and troubles. McCann does a great job channeling the pre-teen brain and every middle school kid’s wish to be exceptional in some way. Her action sequences are also well written, and Charlie and her friends Maria and Mac are realistic despite the unreal things happening to and around them. There’s a definite comic book vibe to GOING WILD, and the cliffhanger of an ending adds to that. McMann has set the stage for an exciting book two, and I’ll be tuning in to see where it’s going to take us. My thanks to the publisher for a copy of the book in exchange for my unbiased review.